When Dr. Lagasse was 10 or 11 years old growing up on a small farm northeast of Rolla, ND, his father had to call the local veterinarian to do a caesarian on a heifer. Dr. Helen Knutt came out to their farm and did the surgery in the barn. His mother who knew that her son did not like the sight of blood (as it turns out, only human blood), did not want him to watch. But he was fascinated and watched the whole procedure. Ever since that night, he has wanted to be a veterinarian. Dr. Lagasse attended North Dakota State University for his undergraduate work and eventually graduated from Iowa State University College of Veterinary medicine in 1992. After working as an associate veterinarian in Devils Lake, ND for nearly three years, he bought Rugby Veterinary Service in 1995. Although a very rural practice, the area has provided a balanced mix of small and large animal caseload. The variety of this type of mixed animal practice is both challenging and continuously rewarding. When time allows, Dr. Lagasse's hobbies include camping, hiking, bike riding, and hunting. Faith is a very important aspect of his life. Dr. Lagasse, who is a member of St. Therese Catholic Church in Rugby, is ordained as a permanent deacon serving the Diocese of Fargo. He also enjoys spending time with his wife Denise, son Michael, and their many pets, most of which have been adopted from the city pound. 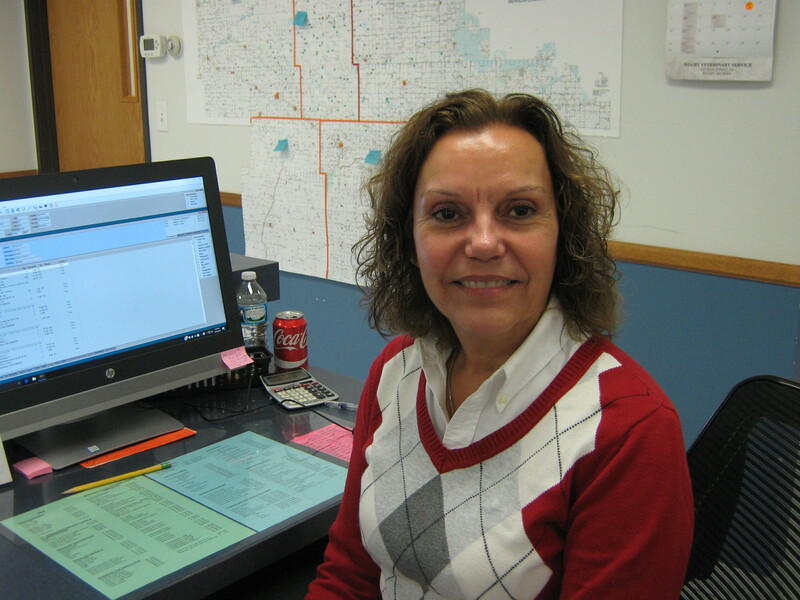 Dr. Gullickson grew up on a farm/ranch north of Amidon, North Dakota. After attending NDSU in Fargo for three years she was accepted to the veterinary college at Iowa State University in Ames, Iowa. She graduated from Iowa State in May of 2000 and has been practicing veterinary medicine with Rugby Veterinary Service ever since. In June of 1998 she married Jason Gullickson, who is currently serving as principal of Ely Elementary here in Rugby. They have two daughters; Reese, born August 2007 and Autumn, born September 2010. The Gullickson family shares their home with an array of animals including a horse (Clover), two dogs (Charley and Scout) and five cats (Fiona, Hank, Moe, Squirt & Mitzi). When Dr. Gullickson is not at work she enjoys horseback riding, fishing, camping, and spending time with family and friends. Dr. Grad-Vossler started out on a farm northwest of Harvey, ND where she also attended high school. She attained a bachelor's degree in Biology from the University of Mary in Bismarck, ND before going on to earn her Doctorate of Veterinary Medicine from Iowa State University of Ames, IA in 1998. Since graduation from Iowa State University Dr. Grad-Vossler has had many varied experiences working in the veterinary field. Just after school she worked with Dr. Sabbe in Harvey until 2000 when she went to Valley City Veterinary Clinic for a year. In 2001 she joined the USDA/FSIS as a Veterinary Medical Officer. She was stationed at Worthington, MN in the Swift and Company pork plant until 2003. 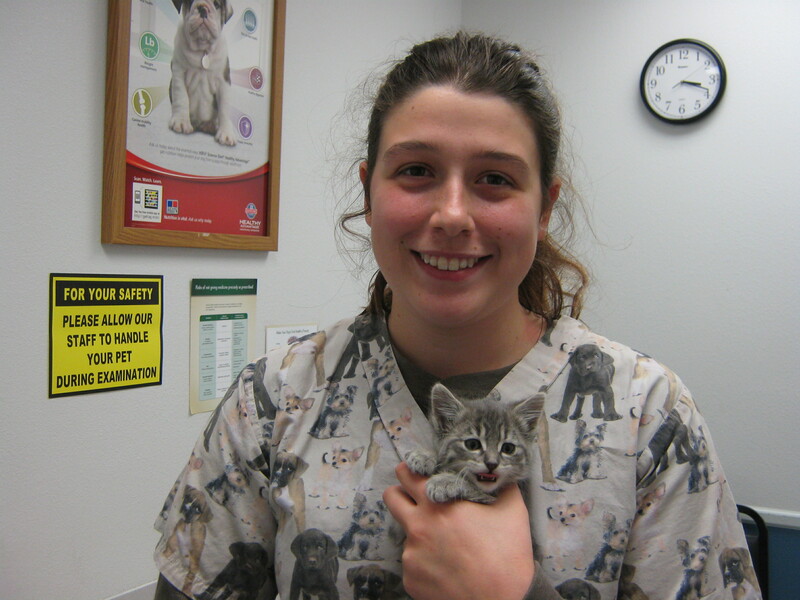 She came back to North Dakota in 2003 to work at the New Salem Veterinary Clinic for a couple of years. In October of 2005, Dr. Grad-Vossler joined the professional staff of Rugby Veterinary Service, PC. Deanna married her husband Gary Vossler in May of 1998. They have a cat, Smokey. Gary is very interested in computers while Deanna enjoys photography and genealogy. Yvette joined the Rugby Veterinary team in October 2005 as a receptionist. In 2012, she finished her on-line classes through San Juan College in Farmington, NM to earn her Veterinary Technology degree. Yvette grew up on a farm near Churches Ferry. While growing up, she always had her hand in helping out with the livestock. She has been married to her husband Leon since 1987. they have two children, Larry and Sami. The family also includes four cats, PieKitty, Crush, Tula and Kazmir (3 of which were acquired from the local pound). She also has a few horses that she keeps at her brother's farm near Leeds. Yvette enjoys the variety of work that Rugby Veterinary Service has to offer. When she is not at work, she likes to keep busy with scrap booking, baking, camping, riding horse and most of all spending time with family. Abigail grew up on a farm south of Leeds. She graduated from NDSU in the summer of 2014 with a degree in veterinary technology, and a minor in Large Animal Veterinary Technology. When she is not working at Rugby Veterinary Service. Abby can be found helping out on the family farm where she especially enjoys helping with the cattle. When she has free time she enjoys being outdoors, running and baking. Morgan grew up in Lisbon, ND and has always wanted to work with animals. She attended Concordia College and graduated in May, 2014 with a Bachelors in Biology and a Minor in History. 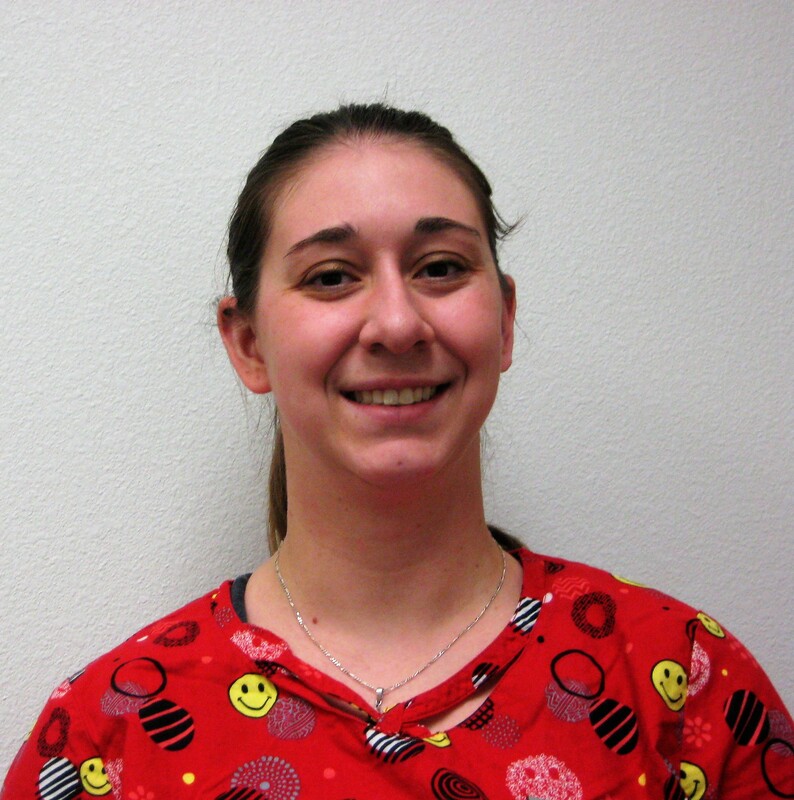 She then attended Globe University in Moorhead for Veterinary Technology and graduated in the summer of 2016. Morgan has been married to her husband Anthony since 2014 and they have a daughter, Lydia. The family also has two dogs; a boxer mix, Revy, and a Basset Hound, Benny as well as two cats; Luffy and Smokey. Morgan enjoys skiing, camping, reading, and just hanging out with her family. Daryl started working at Rugby Veterinary Service in 1999 as a Veterinary Assistant. He enjoys working with animals, which started with growing up on a farm and working with dairy and beef cattle. In 2001 Daryl married Susan. They have three daughters, Amber, Allison and Arica. The Selensky family lives on a farm three miles Northeast of Rugby. They have two dogs; several former city strays turned barn cats, and a small flock of sheep & goats. When he gets a chance, Daryl enjoys hunting and fishing. Emily has been around animals all her life. She enjoys being with animals and in her spare time she trains and grooms dogs. She spends fun time with her pets by dog sledding, going on walks, swimming, and much more. Her Saint Bernard, Penny, especially holds a special place in her heart. Emily also has a cat named CC who can make life challenging, but she can’t imagine life without her. Emily grew up on a ranch and loves the outdoors. Her future plans to attend school to get her dog training and grooming license. Sheila grew up in Jamestown, ND, moved to Casper, Wyoming then on to Albuquerque, New Mexica and finally settled in Aztec, New Mexico. She raised two sons and ran an oil and gas sales and service business. In July of 2016 she traded in the rattlesnakes and sagebrush for the green fields and rolling hills of Rugby, ND. Sheila’s son Alex lives in Lubbock, Texas with his son, Jack. She loves to travel. Her siblings and parents all live in different states. She likes to go to the sales barns with her partner, read just about anything, refinish antique furniture and go to auctions. Samantha was born at Fr. Benning, Georgia, but grew up all over the United States as her father was in the military. Her family includes two cats, Pieface and Tula, and a dog, Abby. She loves to be around animals. Samantha enjoys reading, going to garage sales, camping with her family, riding horses, playing card games and spending time with her boyfriend, Josh. Samantha joined her mother, Yvette, on the Rugby Veterinary Service team in May of 2018. In 1995 Denise started working for her husband Rick at Rugby Veterinary Service. She worked her way from answering phone calls to keeping the clinic stocked with product to assisting with medical procedures as needed. In 2001, when Rick and Denise adopted Michael, Denise was given the opportunity to start working from a home office so she could pursue the job she has always wanted: mother. Now that Michael is at school full time Denise spends her days working in the Business Office at Rugby Veterinary Service, PC. Being a member of Little Flower Catholic Church is central in Denise's life. In her moments of spare time Denise enjoys reading, camping, and hiking. She also enjoys attending concerts and plays. Denise loves spending time learning new things with her family. When Cleo was about two years old she was adopted by Rugby Veterinary Service from the local pound. For a short time she lived with some relatives of the Lagasses but eventually returned to become a full time clinic cat. Cleo's hobbies include sleeping, hiding in drawers, and of course, looking beautiful ("I am a siamese after all").